L’Avventura is a mystery about a missing woman, but the supernumeries in what could have been a police procedural, in other hands, move to center stage under Antonioni’s direction. 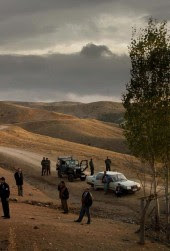 Similarly Nuri Bilge Ceylan’s Once Upon a Time in Anatolia, which shared the Grand Prix at Cannes in 2011 and whose title can’t help but reference another fairytale, Serge Leone’s Once Upon a Time in the West, starts off with caravan of two cars and a jeep with a rotating light, carrying amongst others, a prosecutor, a police commissar and a doctor, who are attempting to locate a corpse in the darkness. The caravan takes on an emblematic significance as it cruises through the breathtaking landscape of winding roads and fields of grass whose beauty and barren immensity are the occasion for window-like set pieces that would qualify as melodrama if they didn’t so perfectly earn the emotion they create. A hogtied corpse is eventually located by a wonderful pair of characters called simply the "diggers." Cemal, the doctor (Muhammet Uzuner) sits next to one of the accused men who have been brought along to lead the police to the crime scene. Chekhov was a doctor (he once said “medicine is my lawful wife and literature my mistress") and Cemal is the Chekhov of the movie, offering not only an autopsy of victim, but a diagnosis of the spiritual illness of his colleagues. For instance, throughout the movie Nusret, the prosecutor (Taner Birsel) repeats the same story to Cemal, about a woman who forecasted her own death. The seeming non-sequitur begins to make sense as we begin to see that the prosecutor aided by his bonding with Cemal, reveals he is talking about his own wife who killed herself, after giving birth to their child, as an act of vengeance for her husband’s infidelity. The prosecutor’s face is disfigured with dark blotches and then in the autopsy sequence as blood shoots up creating blotches on Cemal’s face, a metaphoric blood-tie between the two men is affirmed. During the course of the night and early morning the caravan stops in a town where they are entertained by the local mukhtar, who has an angelic daughter. The daughter transfixes the miserable party while her father makes a pitch for a state of the art morgue. Most of the young people in the town have left and they need their parents’ bodies preserved until they can fly back from places like Germany. Waiting for Godot is the English title of Beckett’s play, but in the French, in which it was originally written, the title was En attendant Godot or “while waiting for Godot.” Like Godot, Once Upon a Time in Anatolia is about the life that goes on and the questions that are asked while men and women wait for the answers to both the great and small questions of human existence. Do not miss this masterpiece.